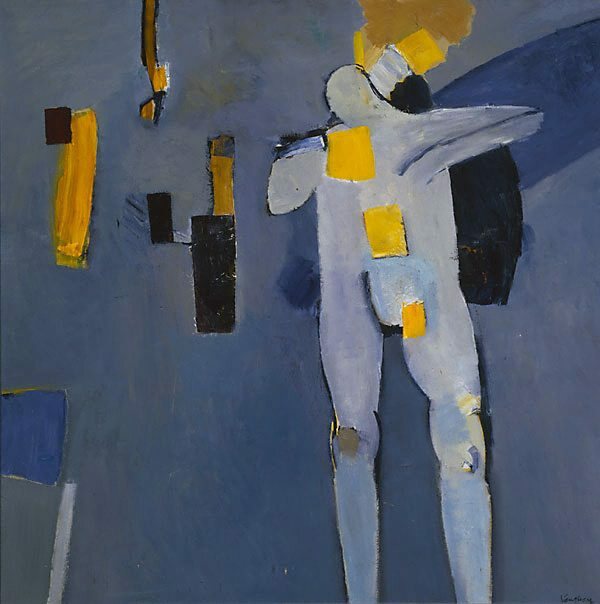 'Figure against a blue background' was closely linked with another painting of the same period, ['Fourth assembly of figures' 1956] now in the Nottingham Museum, originally titled 'Transfiguration group'. Subsequently I altered the titles of both paintings to remove any religious associations, which were never intended. From my point of view the painting is of interest because it was the first time I succeeded in controlling a looser, more spontaneous and fluent style of painting, and uniting figurative and abstract elements in the same composition. While realising the dangers involved in this, I had nevertheless long felt compelled to try and find a common ground for unifying the two elements and reconciling the conflict implicit in the concept of man in his environment (a reconciliation purely in plastic terms and not in illustrative or descriptive terms). Signed l.r., blue paint "Vaughan". Not dated.